A new report today provides some information about the Galaxy S10 camera specs. It was long believed that this would be Samsung’s first smartphone with three rear-facing cameras. That title has now gone to the new Galaxy A7 nevertheless, the Galaxy S10 is still expected to feature a triple-camera. The report comes from a source who has been right on multiple accounts in the past. 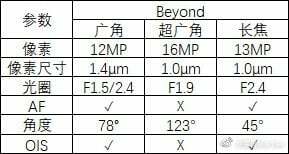 As per the report, the Galaxy S10 may come with the Galaxy S9’s 12-megapixel f1.5/2.4 variable aperture lens as the primary sensor. Previous reports have suggested that it may have a “super wide-angle” lens. These Galaxy S10 camera specs mention a 16-megapixel sensor with f1.9 aperture and a 123-degree field of view. There’s also going to be a 13-megapixel f2.4 aperture sensor to compete this triple camera system. This is the second time that we’re hearing about this exact same camera setup for the Galaxy S10. An earlier report also mentioned that the primary sensor would be in the middle with the 16-megapixel and 13-megapixel sensors on either side. This report also reiterates that the wide angle lens is not going to have optical image stabilization and autofocus. That’s similar to the setup that we have seen on LG’s flagships. In comparison, the Galaxy S9+ features a dual camera system. It has a 12-megapixel variable aperture sensor with a secondary 12-megapixel sensor that has a telephoto lens. The Galaxy S9 only has the 12-megapixel variable aperture sensor. Reports suggest that there will be three models of the Galaxy S10. The first would be a more affordable model that may only have a single camera. The other two will be the successors of the Galaxy S9 and Galaxy S9+. They are both said to feature a double and triple camera system respectively. Samsung is due to launch the Galaxy S10 early next year. It has obviously not confirmed anything about the Galaxy S10 camera specs officially at this point in time. Highly in favour for a small form factor phone! If the keep the 5.8 screen but reduce the chin so it’s about 4mm shorter will be ideal. Please don’t make the phone wider or thicker. But surprising if they are removing the telescopic camera. I want 51/2 cameras on the main S10 so I’m also disappointed! I don’t hope the cameras will be next to each other horizontal, that looks so ugly tbh. The leaked footage of the huawei mate 20 pro with triple caemra looks much better. I think samsung should focus a lot more on HDR for night and day more than anything especially for the front camera. Like Apple, Google and Huwaei.